The term kunoichi, or simply female Ninja, stands for a Japanese woman, a professional Ninja from the Ninja class of warriors who are adequately and specifically trained to become a perfect killer and spy. Women are attributed to more charm and power towards men and thus, there are places closed for men but for the charming and seductive woman all the doors are open. The kunoichi would take advantage of this very often. To the set of techniques and schools the male Ninja are skilled in, the kunoichi top up special technique of allurement called miryoku-jutsu becoming Ninja seductresses. “Flowery combat” is among one of their skills. The kunoichi act as a spy, an observer and a messenger. They are mostly trained based on psychological techniques like feminine charm, manipulation, female intuition. • The techniques of seduction. The kunoichi are highly skilled in giving sexual fulfillment to men and they can give a head start to any expert rubber. The kunoichi are also trained to keep their emotions and feeling in tight while they are masters in revealing other’s emotions to manipulate for the sake of their mission. They are also prohibited to have relations with their mission targets. The kunoichi start trainings differently from male Ninja. They are not trained to walk silently or overcome obstacles first; they are trained to turn away, safely fall down and get up swiftly this is the art of taihen-jutsu (body movement skills). Physical loads make woman look more masculine, the weapon leaves palms callous and striking exercises make extremities look ugly. Therefore, the training is mostly focused on the subtle training on the close combat and use of smaller varieties of weapon to be able to hide easily. With the purpose to distract attention from the basic trainings, the kunoichi also learn the tea ceremony tradition; they master the play the musical instruments, the technique of dancing and singing and many other skills. They also can use their long sharp fingernails and deadly hairpins to kill the opponent, if necessary and return to pretend doing peaceful activities. The kunoichi-no-jutsu is also called the art of women versus men. A perfect kunoichi has to master weak points and anatomy of men to be able to use the gained experience in practice. • Oyagoroshi – fracture of a thumb. When it comes to learning martial arts and practicing these techniques, a woman should consider and evaluate the complexion and anatomy of herself. 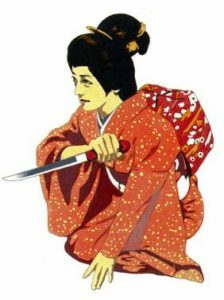 Most techniques learned by Ninja are known to be “dirty” and “mean”, though a woman should be quite behind these concepts when she has to confront a strong male enemy.